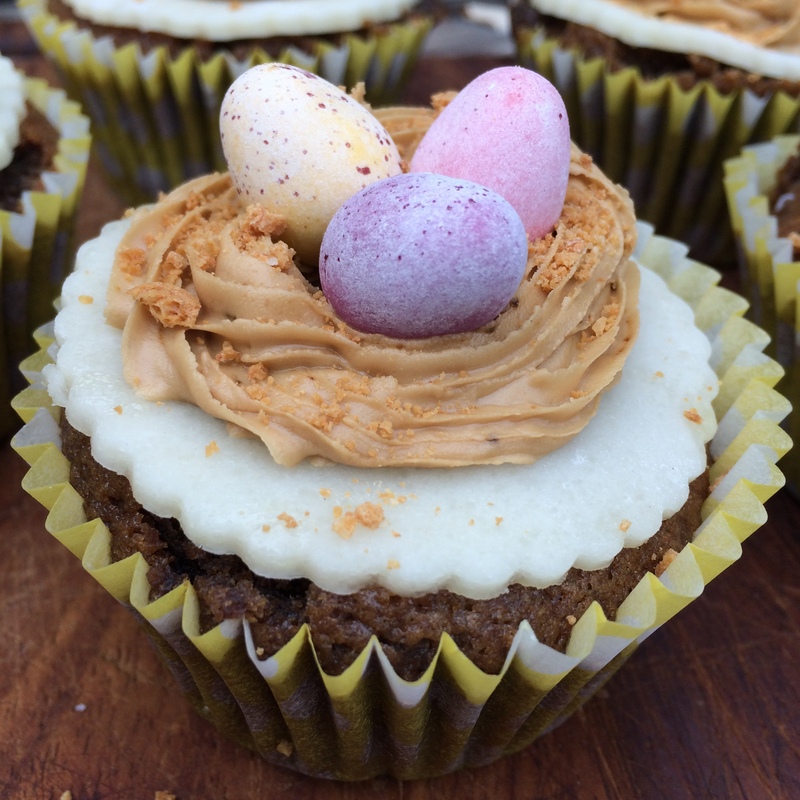 Coffee Amaretto Easter Cakes (dairy and gluten free!) – Beanies Bake off! 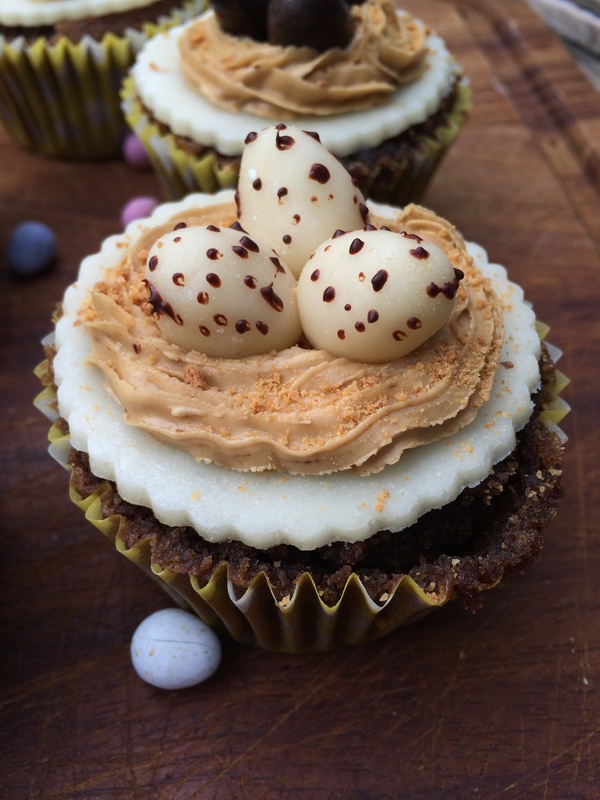 Beanies Coffee asked 10 bloggers to create a special Easter recipe creation for their #BeaniesBakeOff competition using their flavoured coffees. I was lucky enough to be one of those bloggers! yay! So it was with great excitement that I opened my package of beanies coffees. They sent me 5 delicious flavours to play with – creamy caramel, amaretto, french vanilla, rich hazelnut and cinnamon. There’s a lot going on in this recipe, but the beauty of it is that you can leave out any element of it. If you just want to make the cakes and ice them normally, they will still taste delicious. If you want to take a few shortcuts and use bought marzipan or “real” cream in the middle (or have no cream in the middle!) then you can. You can make this your own! The other bonus is that you could substitute other coffee flavours in here if you wanted to. I’ve gone with the Amaretto coffee for a more grown up little cake. You can use the ground coffee or their instant version (if using the instant make it even stronger! 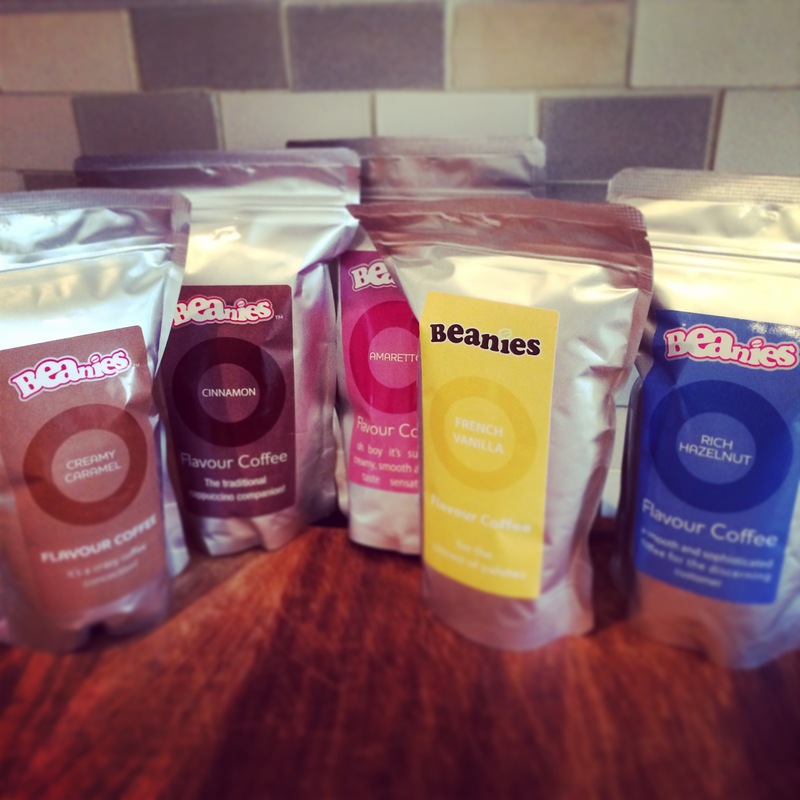 ), and you can also use a decaf version too – so many choices! 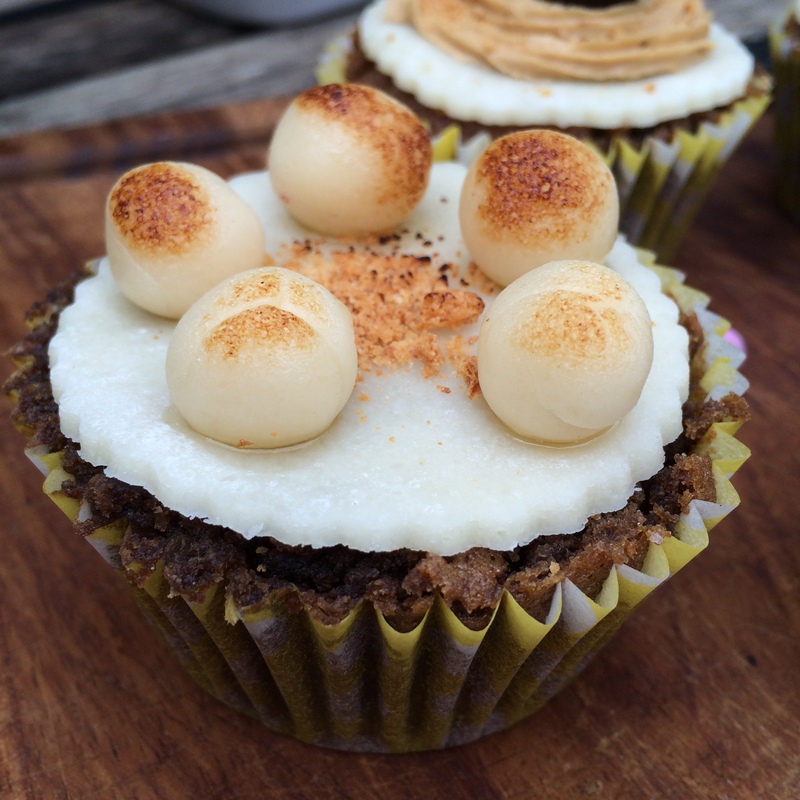 🙂 The Amaretto flavour works brilliantly with the marzipan which gives a hint of a traditional Simnel cake flavour. Before we start we need to do a little prep. If you want to fill the cakes with the coffee cream as I’ve done then you need to pop a can of coconut cream (and it needs to be a can) in the fridge, upside down (yes upside down) for at least 12 hours. 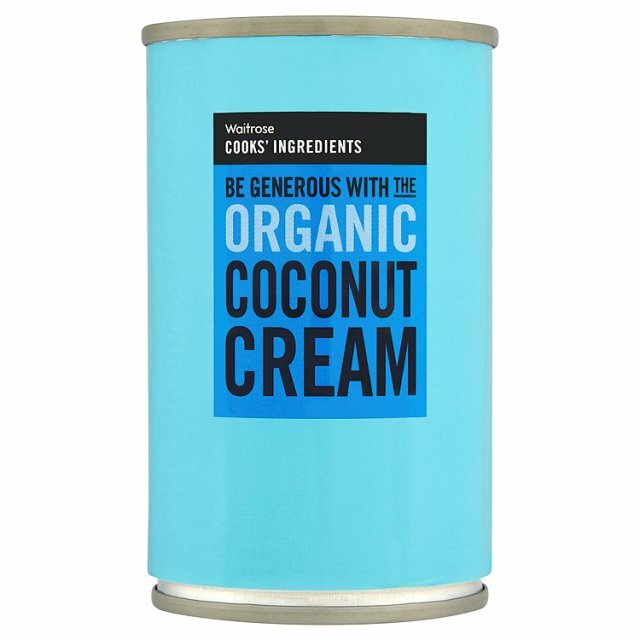 I use this brand of coconut cream (and you only need a small can – 160ml) but you can use any brand with a high coconut extract content (65% or more is best). Why do you need to put it in the fridge? 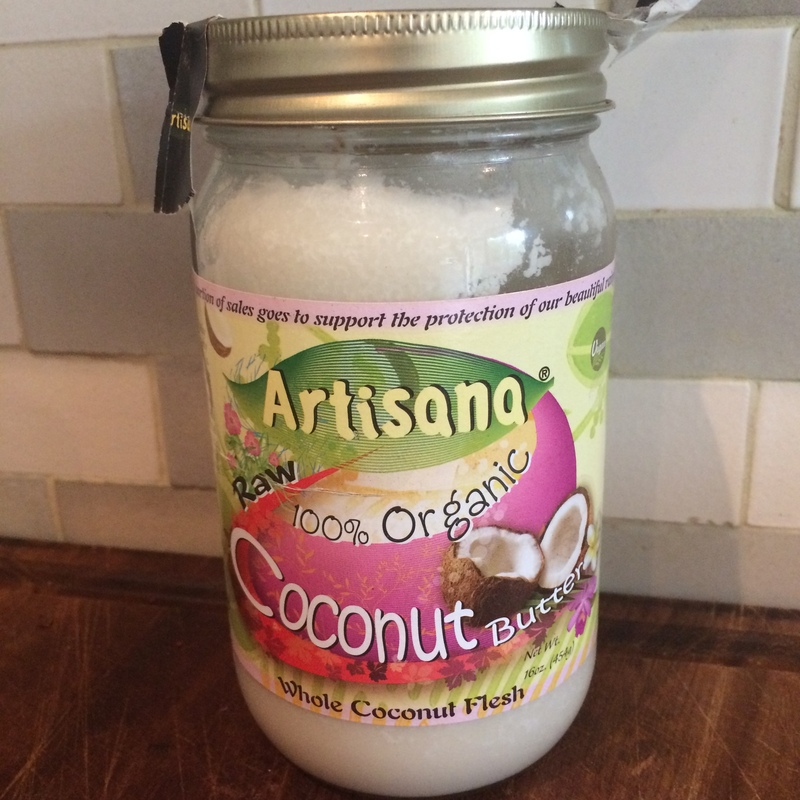 This allows the hard coconut cream to settle to the in the can. You can then open the can (open it upside down – so open the bottom!) and you will see a layer of clearish liquid coconut cream – pour this off carefully (don’t throw it away – you can use it in smoothies etc). Then scoop out the remaining coconut cream! Store the cream in the fridge while you wait to use it in the recipe (best to keep it as cold as possible). You can decorate these how you like. 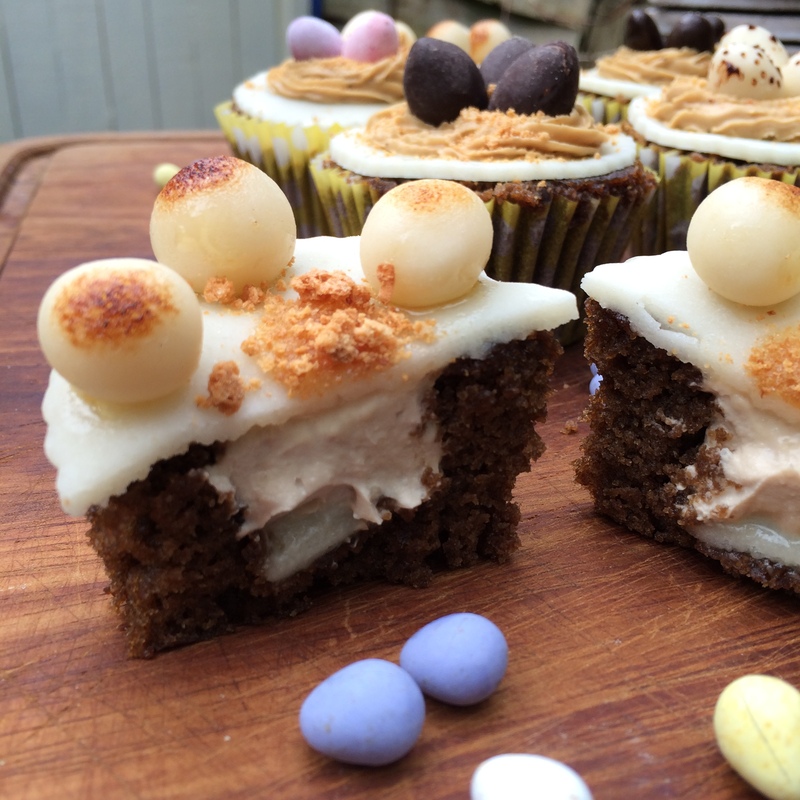 I did two versions – a little nest of eggs, and a simnel cake-style circle of marzipan balls. If you want to go for the nest of eggs you will need some eggs! 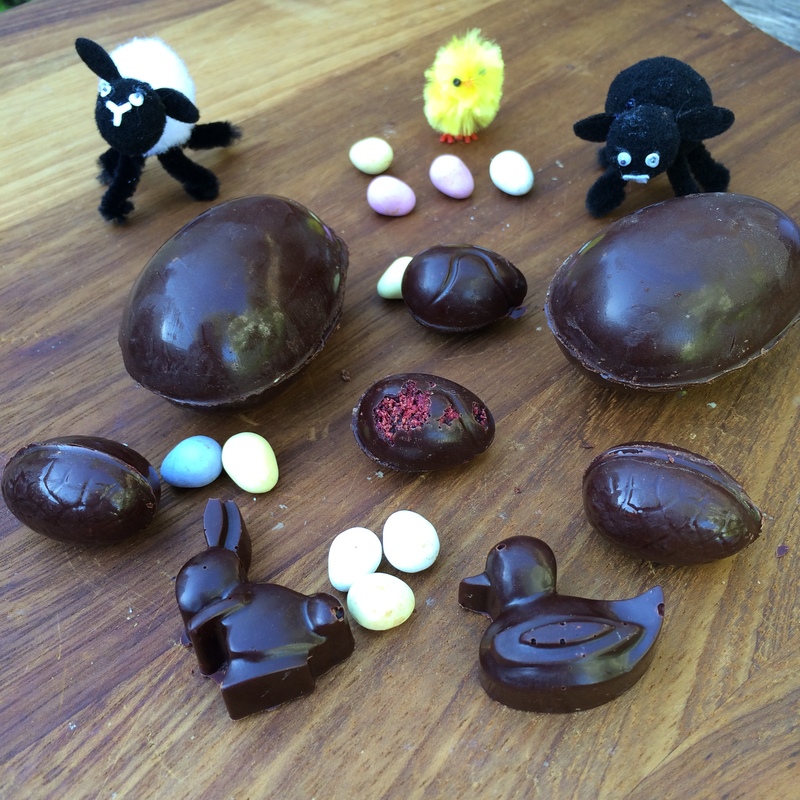 You can use any little eggs you like – mini eggs work well as do chocolate covered carob beans (for something a little more grown up), but if you want to go for something homemade or dairy free then two other lovely options are marzipan eggs and raw choc eggs. 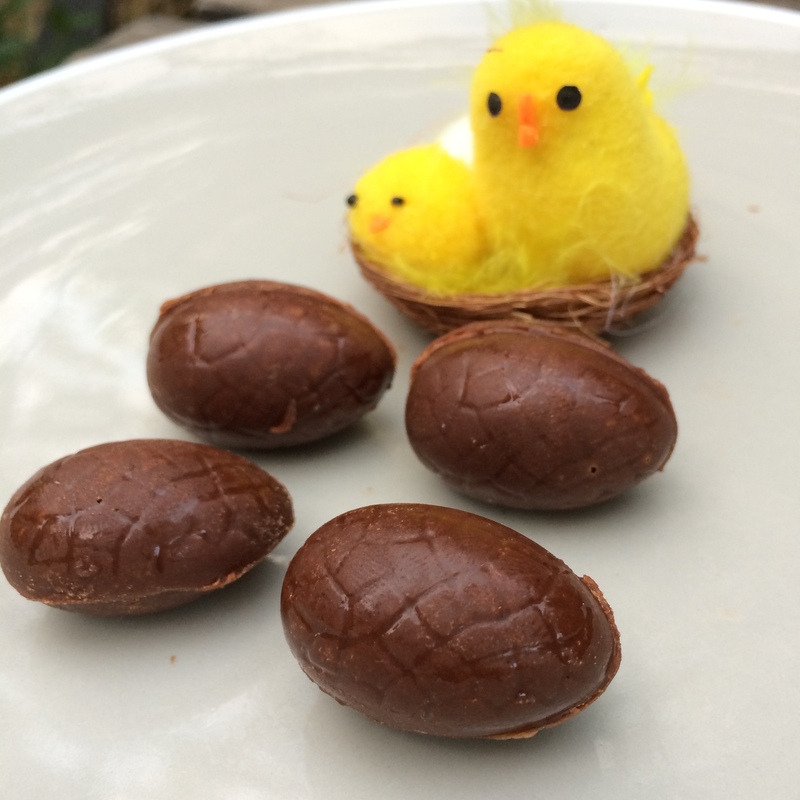 The marzipan eggs are easy – just mould a little of your marzipan in to an egg shape! 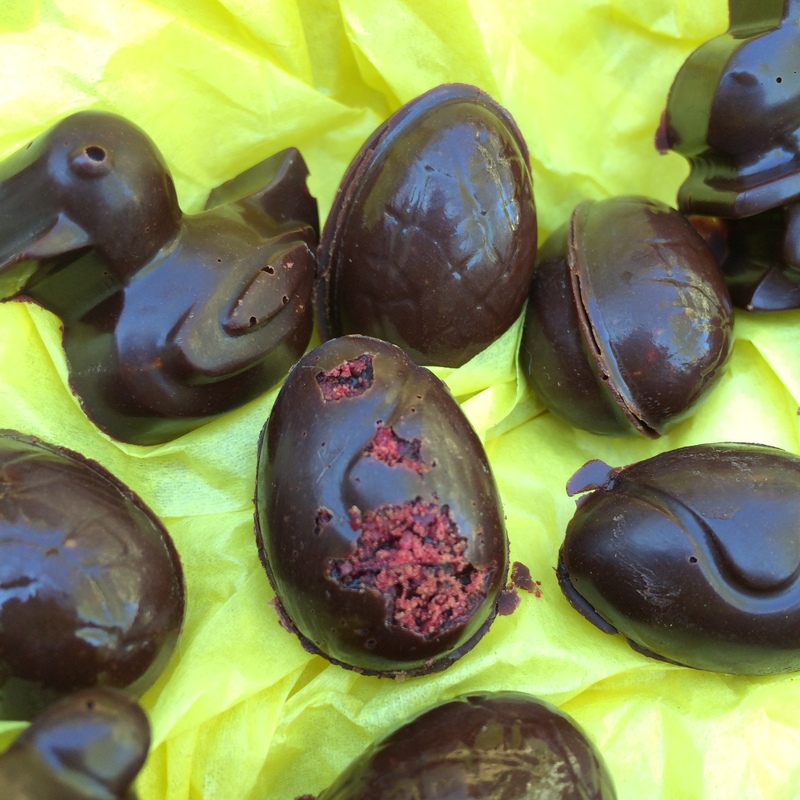 I then dotted some melted raw choc (or you can use dairy free chocolate – Willies Cacao works well) to make them speckled eggs! If you’re feeling adventurous you can also had a small amount of the ground or instant coffee (if you’re using the ground coffee you will end up with a gritty texture – but I quite like that :)). 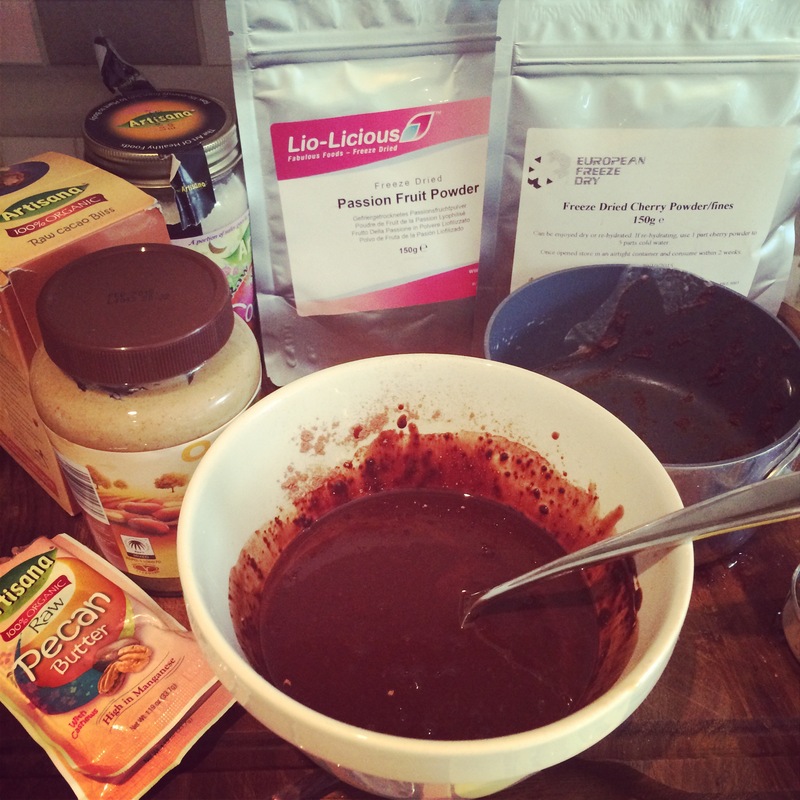 Mix the ingredients together, adding your coffee to the melted cacao butter (add to taste). 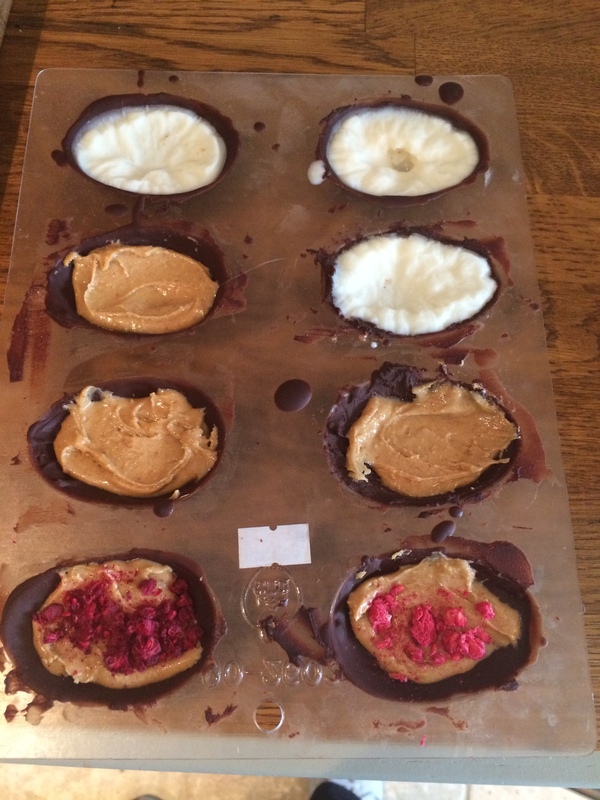 Then pour in to little egg shaped chocolate moulds. 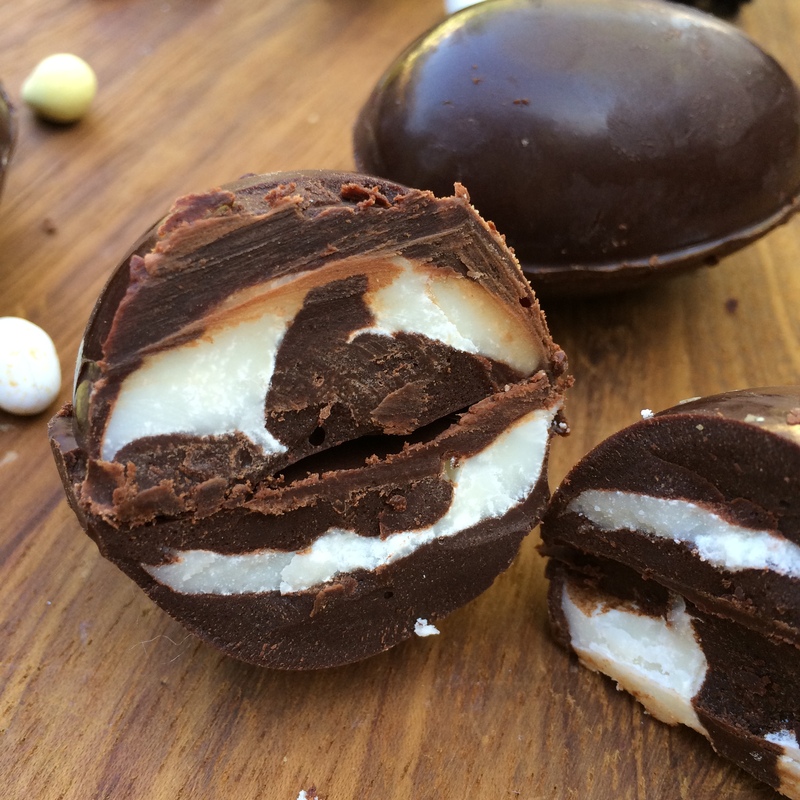 Save a little of the chocolate to stick your egg halves together. 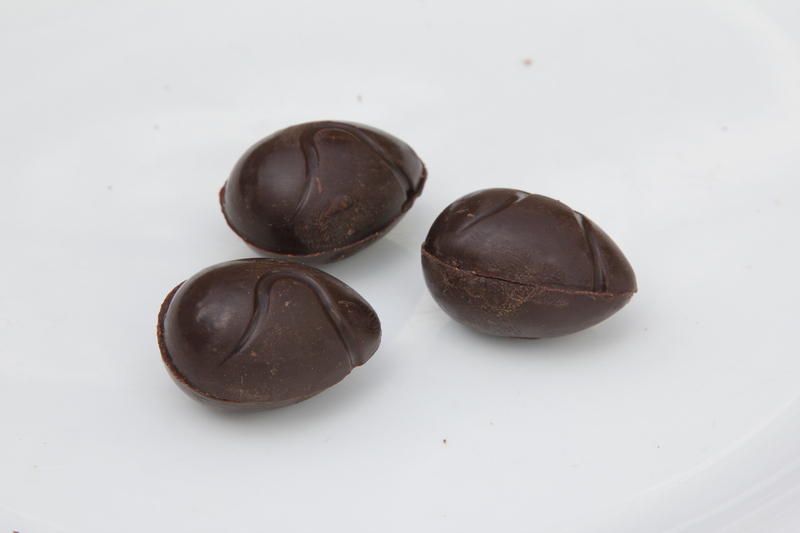 Allow to set in the fridge or freezer, then remove and “glue” the halves of the eggs together using the left over raw choc. Leave in the freezer until ready to add to the cakes. You will also need to make a nice coffee before you start! No seriously – aside from making one to drink 🙂 you will need to make up a pot of strong coffee. Make it stronger than you would usually like to drink it – it has to be strong to hold the flavour when you bake it. I used the Beanies ground coffee in this recipe and I used approx 6 tbsp coffee and 1 cup of water, but adjust to suit your taste. 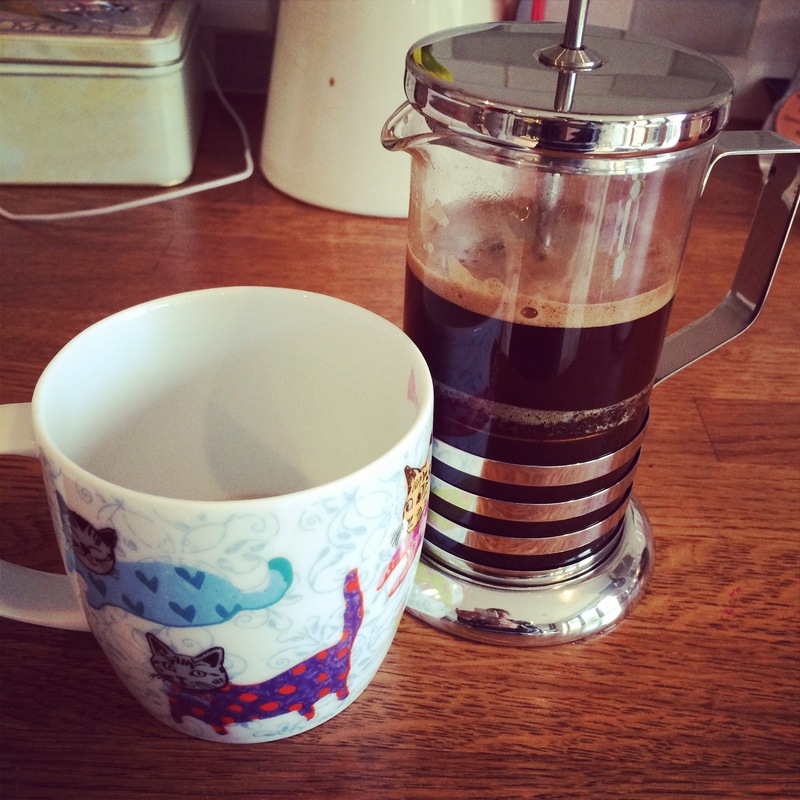 If you’re using the instant blends then equally just make a really nice strong cup. Time to make some cakes! Put the milk and vinegar together in bowl and whisk together, then leave to curdle for a few minutes. Add the milk mixture, oil, sugar and coffee to a large bowl and mix together. Sieve the flour, cornflour, baking powder, bicarbonate of soda and salt into the liquid mixture and stir well until no large lumps remain. If you find it’s still quite lumpy you can always pass it through a sieve. The mixture is VERY liquid so do not worry about this – it’s normal! 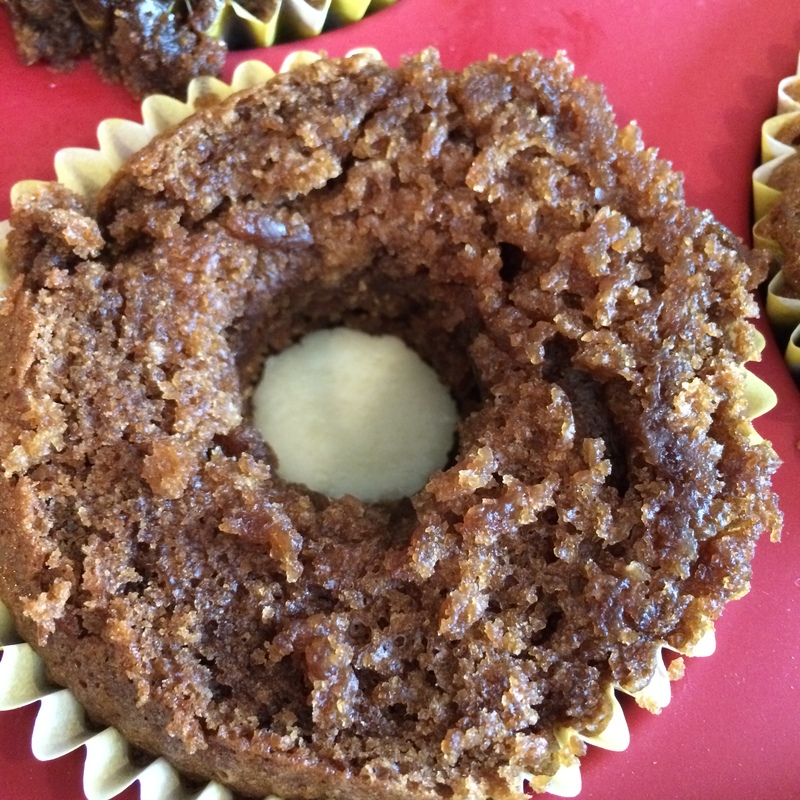 Pour into cupcake liners in a muffin pan. Place in the oven for 20 – 25 minutes until a skewer inserted in the middle comes out clean. 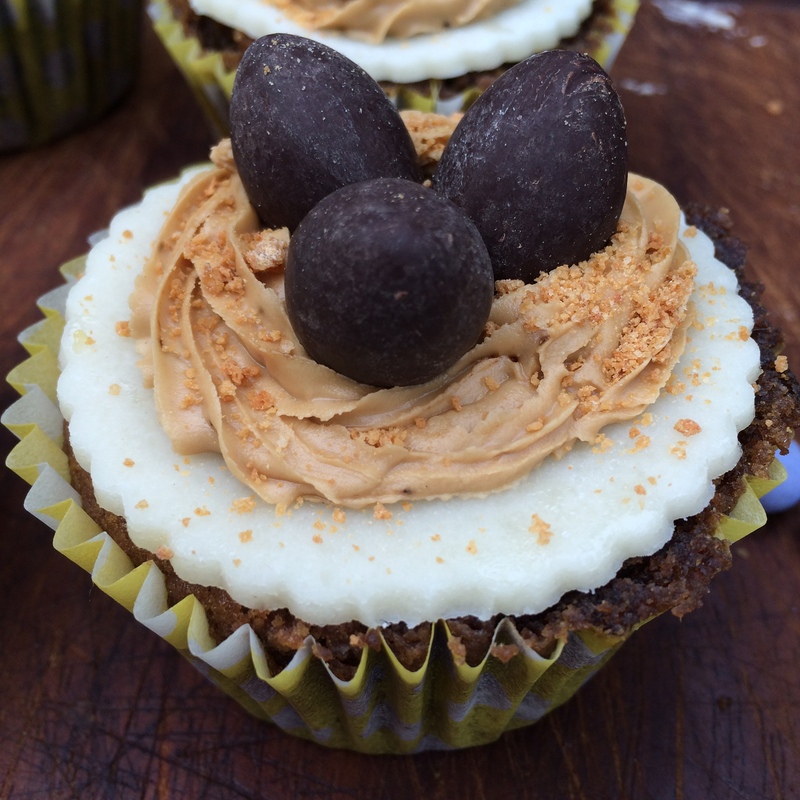 Using a cupcake corer (or a knife) cut a hole in the cupcakes to create a little well for your filling. 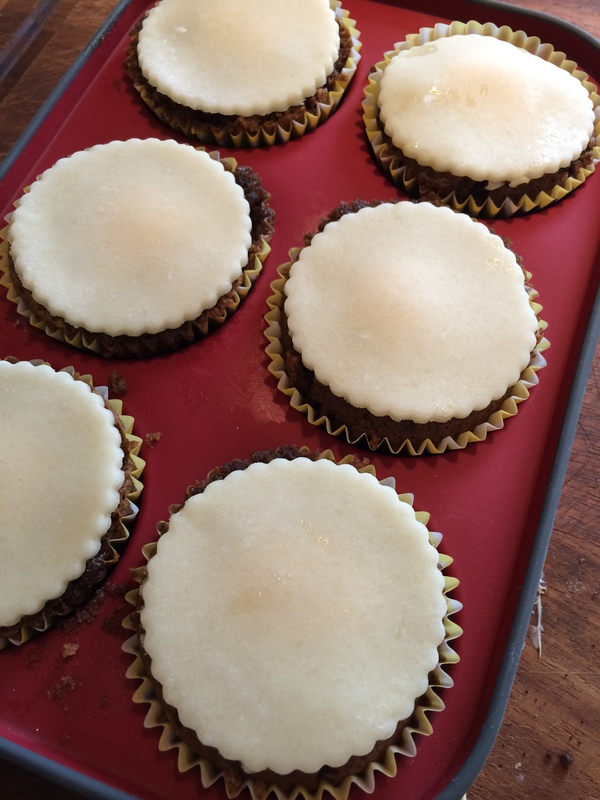 While the cupcakes are cooling further roll out your marzipan into a thin sheet (few mm). Use a little icing sugar to dust the board and rolling pin to prevent sticking. 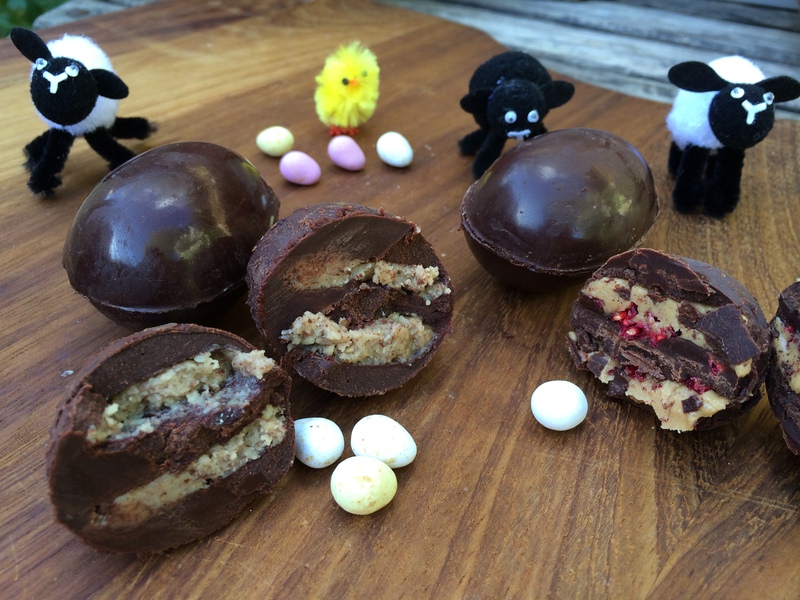 Take the small discs and pop one in the bottom of then hole you’ve just made in each cakes. Ideally the cakes will still be a little warm which will melt the marzipan very slightly. Top tip – if the cakes aren’t still warm then pop them back in the oven (don’t turn it back on – it will still be warm from before) and leave them for 5 mins or so just to soften the marzipan a little). Allow the cakes to cool completely before you attempt to fill them with the coconut cream. While they are cooling you can prepare the cream though. Take your coconut cream which you prepared earlier (see above) and pop in a clean bowl. 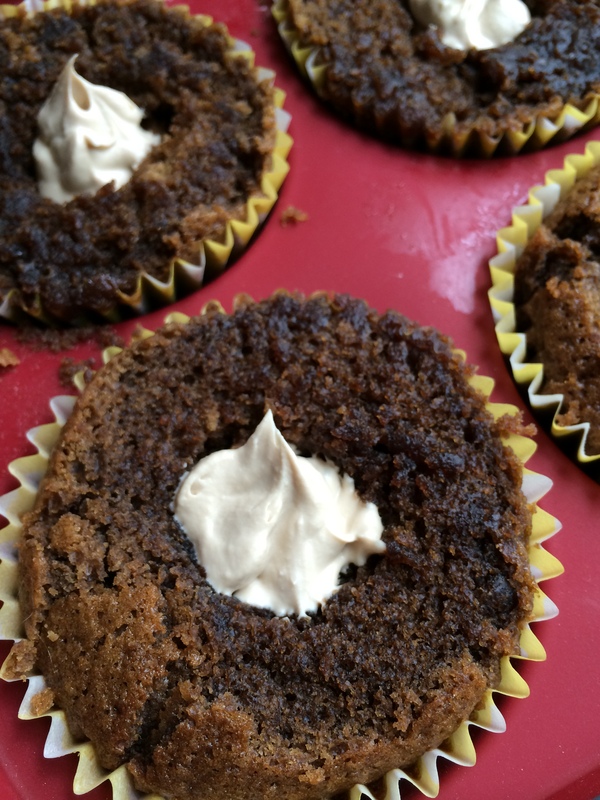 Gently, using a fork, whisk the coffee and icing sugar in to it. If this is a strong enough flavour for you then you’re fine. If not though then take the small amount of instant or ground coffee and place in a pestle and mortar and grind to a fine powder. Stir that in (for a real coffee kick!). Add a few drops of amaretto if you fancy it (or almond essence if not). 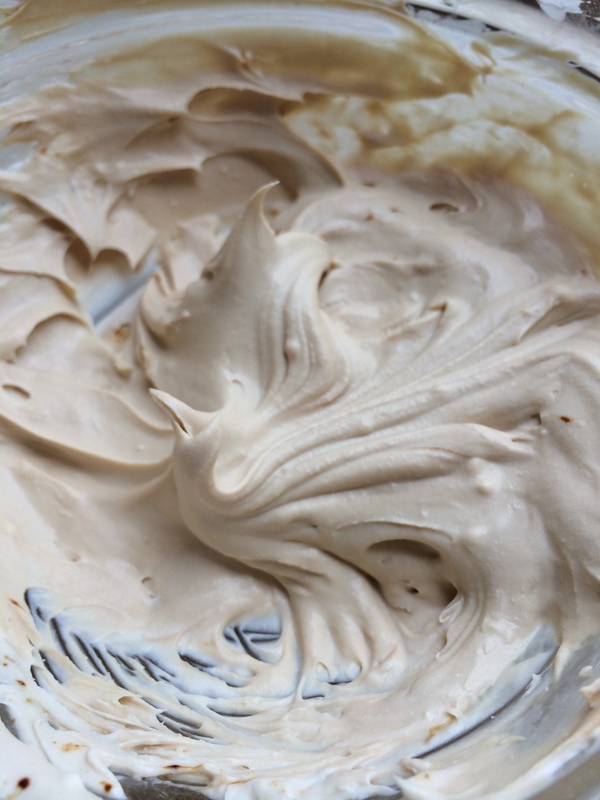 Be careful not to add too much liquid and not to over mix – you want the cream to maintain a thick, almost whipped texture. You can then spoon or pipe this in to the cakes. Fill right to the top. 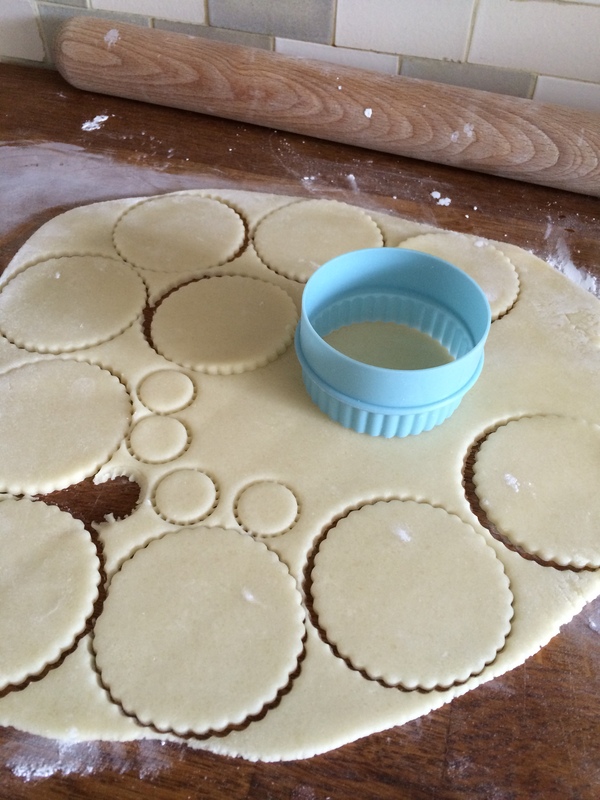 Then you’re ready to add your larger marzipan discs to the top. Take a small amount of apricot jam or marmalade (or jam of your choice) – I used homemade marmalade made by my very good friend Colette from Colette’s fitness kitchen. Melt it in the microwave for a few secs (or on the hob if not) so it’s liquid and then brush on to the back of the marzipan discs and stick the discs to the top of the cakes. 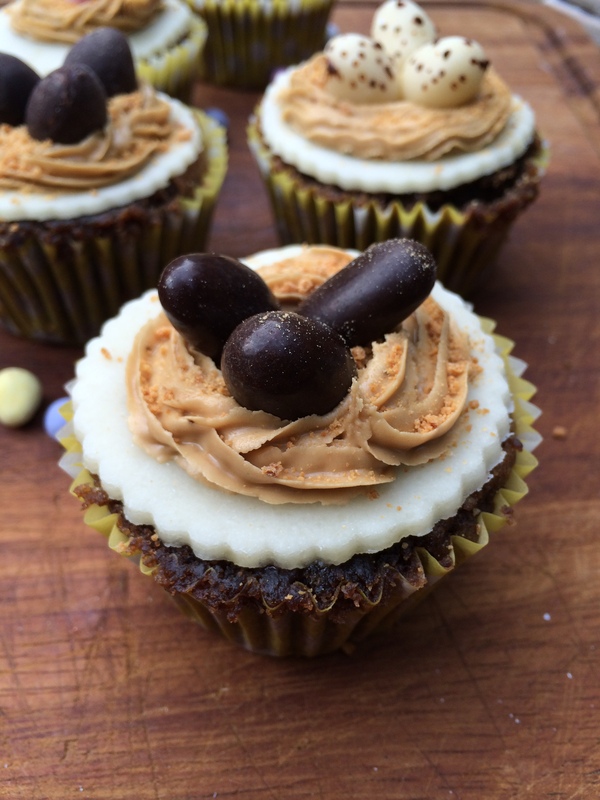 Mix the icing sugar with the strong coffee and a dash of amaretto (or almond essence) to form a nice thick icing. You want it to be quite stiff so it holds it’s shape when you pipe it into the nest shape. Pipe it straight on to the cakes in a nest shape and add a little tiny amount in the middle (to stick the eggs on with). Whilst still wet sprinkle with crushed amaretti biscuits if you want to. 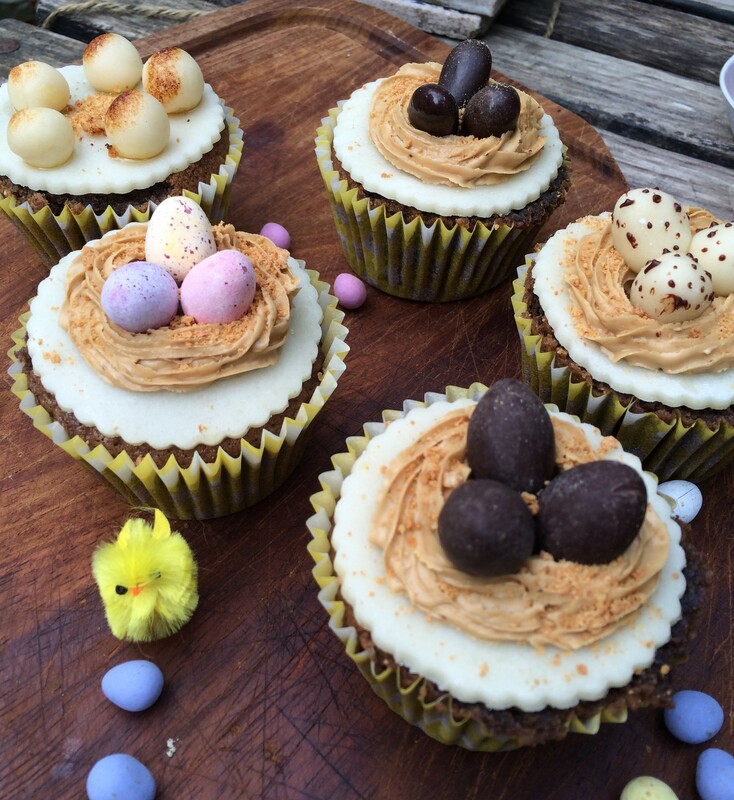 Everyone loves a fairy cake don’t they? 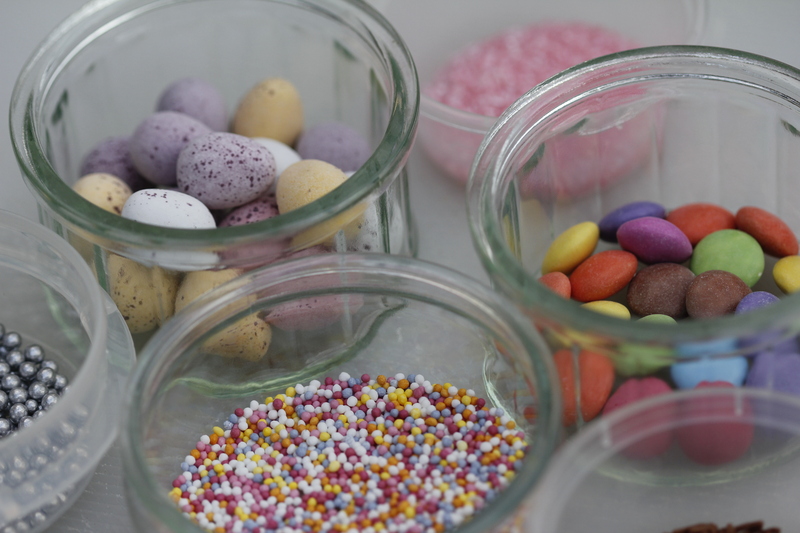 And I bet you all remember the first time you made them with mum, or dad, or gran or the cat! 😉 I certainly do and whenever I see them now they take me right back to those days – the excitement of watching them rise in the oven, getting to lick the bowl, and the best bit – icing and decorating them! 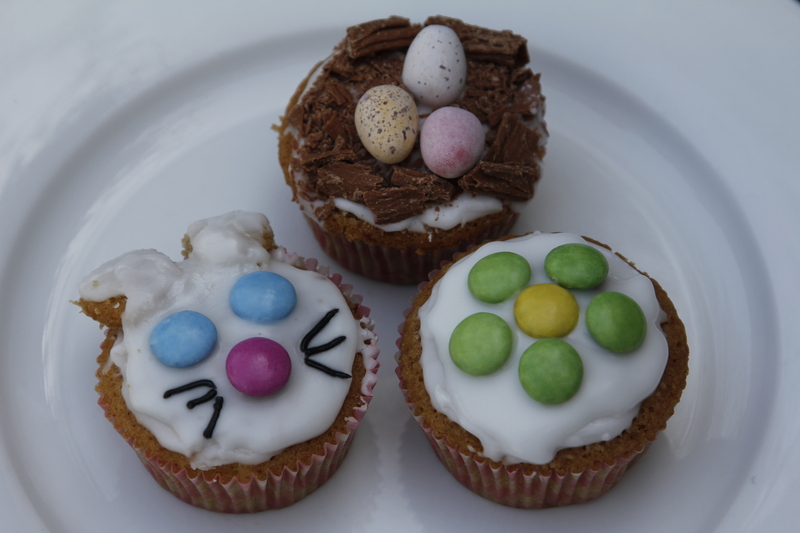 So I thought, as spring is in the air, Easter is coming up, and school holidays are on the horizon that it was about time to post a fun recipe for fairy cakes that’s dairy free and low gluten for you to make with the kids. 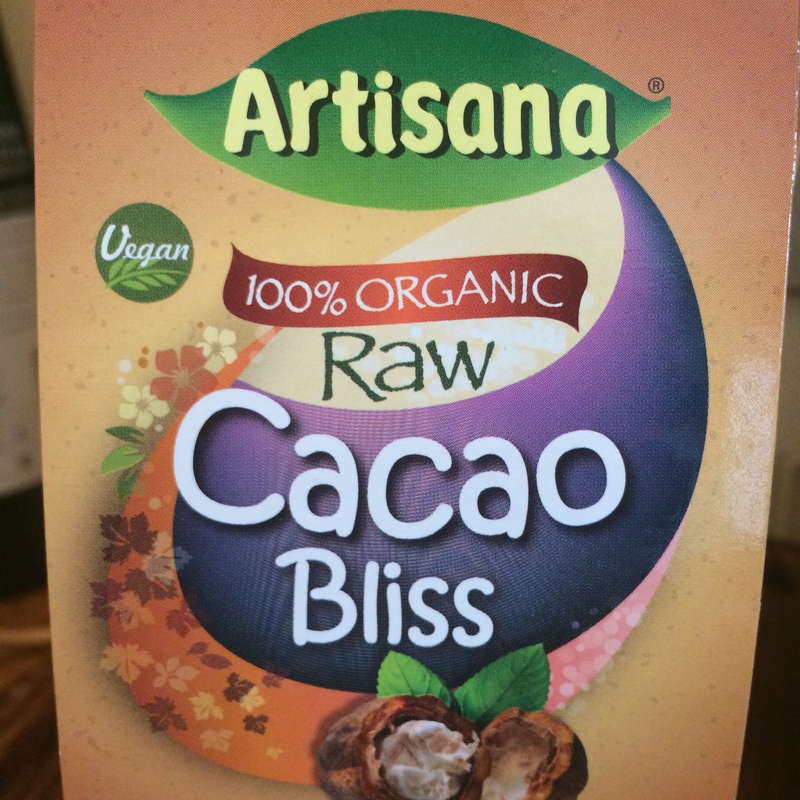 It’s not just for kids though – I don’t have kids and I still loved making them (not sure what that says about me though 😉 ) and better yet they’re only about 125 kcals each! 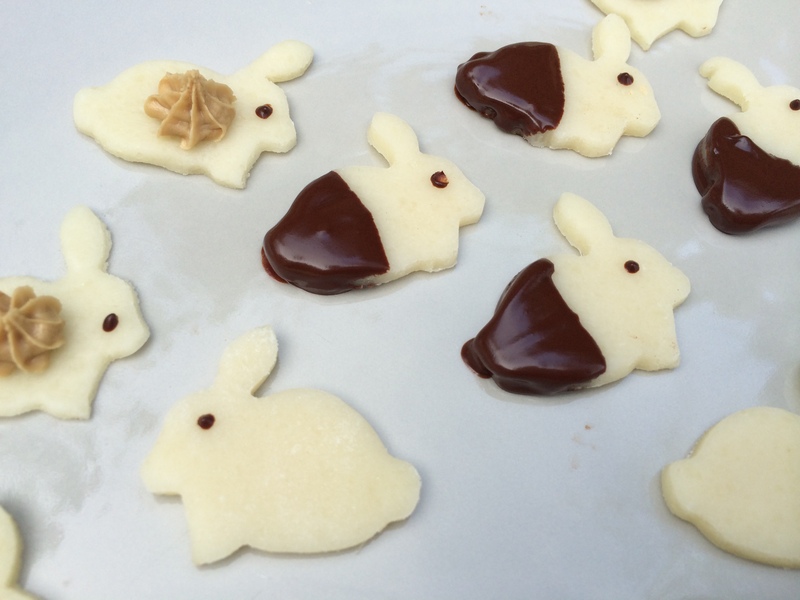 Raw golden icing sugar/normal icing sugar – enough to ice them! Preheat oven to 350 F. Put the soya milk and vinegar together in bowl and whisk together, then leave to curdle for a few minutes. Add the soya milk mixture, oil, sugar and vanilla extract to a large bowl and mix together. Sieve the flour, cornflour, baking powder, bicarbonate of soda and salt into the liquid mixture and stir well until no large lumps remain. 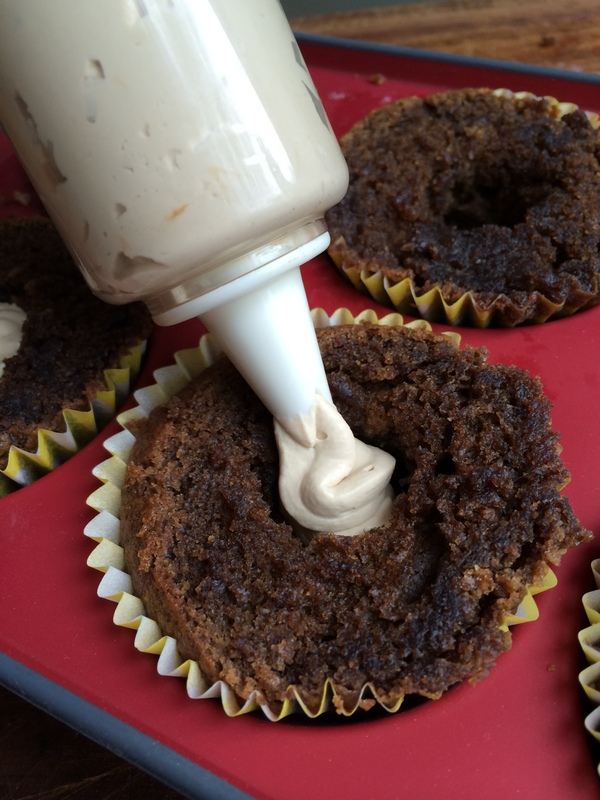 Pour into cupcake liners in a muffin pan – this should make approximately 15 cakes. Place in the oven for 20 – 25 minutes until a skewer inserted in the middle comes out clean. Once done place on a wire rack to cool. Wait until they’re really cool to ice them. 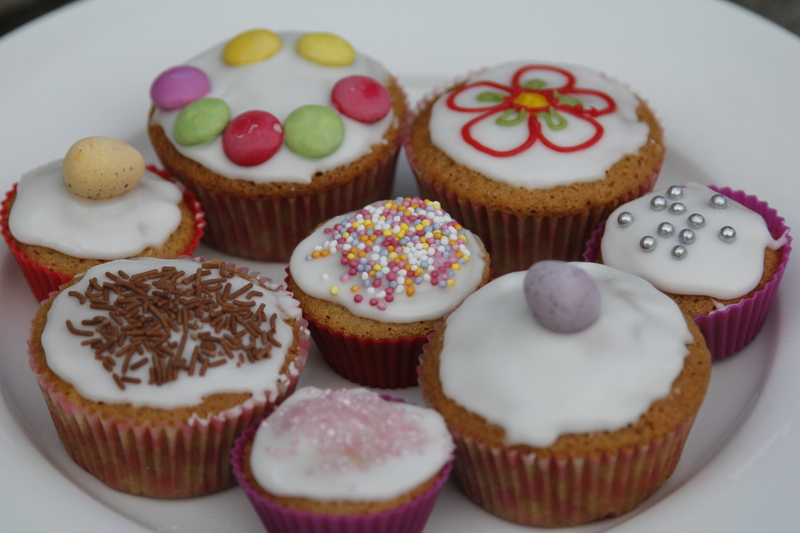 Mix up some icing using the icing sugar and a few drops of fresh lemon juice (if desired) and water until you get a paste-like consistency. Ice the cakes and then let the fun begin – decorating! The world is your oyster – you can do whatever you like. 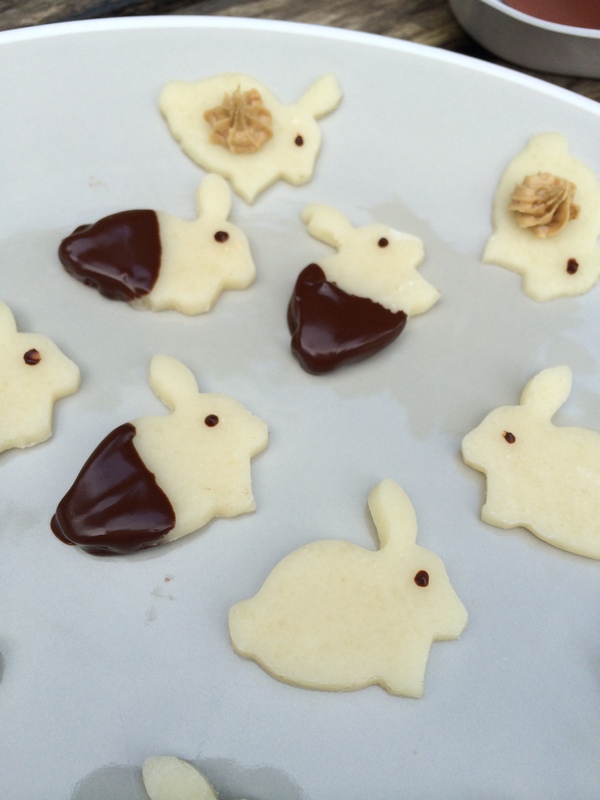 For Easter why not try making some little chocolate birds nests or flowers, or you can have a go at a little bunny. To make the ears slice the top off one of the cakes (inevitably you will have one that has risen too high so you can use that) and carve into ear shapes. Ice lightly and then stick on with more icing. They tend to flop a bit but I kinda like that! 🙂 Then eat!